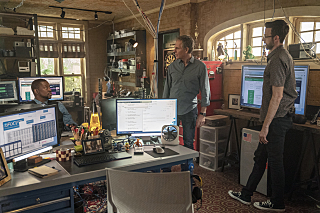 NCIS: New Orleans 5.15 - "Crab Mentality"
previous mission in Oman is used against her as blackmail. 1.I think it needs to be said all the time . 1. that is true and it worked. it was a good episode with team work and everyone contributed something to solve the case. the accused woman was played by the actress who once played agent lee. don't like when they do that and that was probably the reason why I thought she was involved. but she was innocent. we also heard two nice references to "tokio drift". lasalle drove the car and was skidding through the bends and when gregorio warned him he was getting too close to the edge he said:"I know what I am doing." when they finally got the perp he said: "I still got it." I would like to read the dialogue of Hannah Khoury to Pride about the post-coup (Iran) rise of a private sector paradigm. I have poor internet, tech skills and hearing. Any help would be appreciated. Thanks. "So they recruited operators with savvy business sense and embedded them in private companies outside the reach of congressional oversight, and the economic hit man was born. You saying like a shadow CIA? Historically, yeah, but these days, economic hit men are global. If an industry feels threatened by a disrupter They hire someone to maintain the status quo. - By destroying the competition. They use financial pressure, sabotage, blackmail, and if they're good, they don't leave a trace." Completely agree with wondering why these shows are reusing actors. Especially ones which have been a part of major plots. I find it interesting how it worked out I watched the LA episodes with Kerr Smith yesterday & now this one with Liza Lapira... Do they think the fans are stupid or just only watch one show in the franchise? Or are they running out of actors? I was trying to remember where else I had seen her before I frogot she had played Agent Lee! I just don't think they really care probably about which actors they use or reuse and probably don't think many fans would notice. I thought it was an ok episode. Like you Chelle, I was a bit on the bored side with it. I haven't watched the next episode, but I hope it does not take all season with this storyline. I honestly hate when they get dragged out. Yeah I really hope it isn't dragged out too! Especially when Hannah is new so fans are still getting to know her. Nice to have a focus on someone other than Pride though!